Nancy was dissatisfied with her smile. She didn’t like the color of her teeth and the old dark bondings. Her teeth were crooked, stained, decay and worn out. 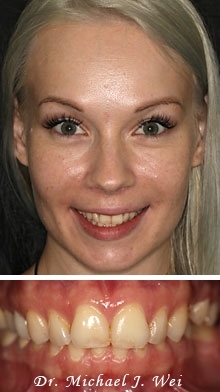 She wanted a beautiful, healthy new smile so that she can regain her confidence both professionally and personally. 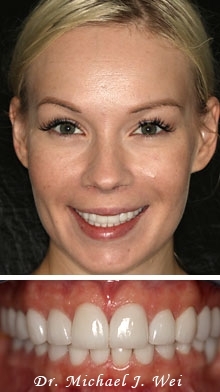 We gave her what she wanted with porcelain veneers, porcelain crowns and a porcelain bridge. She is now very happy with her results and says her smile makeover was definitely worth the investment.